Yeah, I don't even get the launcher. I stopped getting TTG games after BTTF so I never bothered with TWD-onward. It makes sense that those games with the cloud decision comparisons would require account authentication. But then, you can get those on Steam and even GOG now so it's not essential. Though, you can still link those games with your TTG account in-game. I'm going to Dashing's wedding in a week. Something tells me we're all going to be talking a lot about Telltale. I don't have much to add in regards to the demise of Telltale, other than to echo what others have already said; I'm sad for the employees and the raw deal that they received (some of the personal stories coming forward are truly egregious) but in all honesty, I'm kind of glad to see the studio itself go. I feel that Jim Sterling's two videos on the subject cover my feelings towards the whole fiasco well enough. I hope that the ex-employees get their much deserved compensation and soon find new jobs at other studios, ones which actually respect and value their talent. 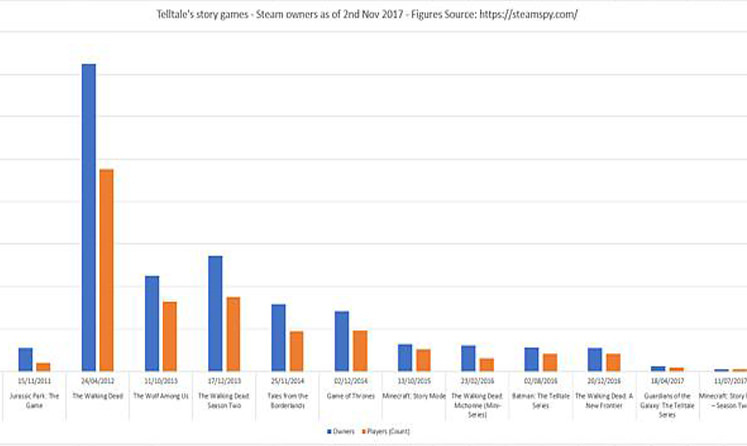 ...I was quite surprised to see such a sharp decline in sales between seasons 1 and 2 of The Walking Dead (less than half the total number of players for the second season). I guess that more people were nonplussed by the first season (as was I) than I had initially thought. It makes one wonder why they so rigidly stuck to the same old, tired formula for the past couple of years. I guess that they felt that grabbing hot intellectual properties would be enough to recreate the hit of The Walking Dead: Season 1. The phrase 'resting on one's laurels' springs to mind (as does 'what goes around, comes around', for that matter). The old mutt's been put out to pasture. It was kinder this way. Once the rabies kicked in and innocent people within her vicinity were being crushed betwixt her frothing and mighty maw, it was time to euthanise the dog. I choose to remember the good times; before the madness; before the screams; before the tears of sorrow; before the blood and carnage. Let's all look back and recall that first moment when we all laid eyes upon that lovable little puppy, so full of life and limitless potential, with a Bone laying at the tips of her paws. I guess by that point, they had no choice but to keep going forwards with the TV/movie IPs because they were worried that the Walking Dead players wouldn't care about actual adventure games. And then it turns out Walking Dead players didn't even really care that much about Walking Dead. I sometimes imagine that if Walking Dead had been middling, maybe we'd be talking about Tales of Monkey Island 2 right now instead. According to this thread, all games pre-TWD have been made DRM free. At the very least, I highly suggest you download Wallace & Gromit now, if you own it. After the forum split, I just never really got a feel for this place. I don't think I've ever posted outside this thread. I think I was just really burned out after the big fallout, and I needed a break from things. I kept in touch with the very best of the friends I'd made, but I wasn't really in any mindset for keeping up with public forum. I was also still dealing with the recent loss of my mom, so life was pretty hectic at the time. By the time things settled down, the forum wasn't a part of my routine anymore, and while I continued to check in on this thread from time to time, and I thought of you guys often, I just never really made that plunge back in. I came back tonight to see what everyone was saying about the closure. I really wasn't expecting to find people saying that they missed me. It really means a lot to me. I can't promise that I'll be a forum regular like I used to, but maybe I can try to check in with you guys more often? Oh, and as far as what's been going on with me, my dad burned down my kitchen with a Pop-Tart and a faulty toaster about four months ago, so I'm waiting for my house to be rebuilt. Thank goodness for good insurance coverage. Way to undersell it. We're going to Dashing and Tope's wedding in a week. When the two of them met up with Jake at PAX last month, he described the news as "the best thing that ever came out of Telltale". Damn, I want to live in that timeline now. Really depends on if Disney was willing to play nice with the license, though. But hey, maybe in one universe out of a million, it worked out that way. Umm... (enunciating slowly) you left the reddit-style TTG forums to then go to Reddit. hmm. Wherever I would hang out, it would really need an Off Topic because I don't really need to, for example, just hang out on the Plex forums to talk to those people there about only Plex. I'm not aware of Reddit having (or supporting) lengthy meandering conversations about random whatsit. Not that I visit Reddit, but really. Nested posts don't sound that great. Interestingly, it would seem TTG's forums at some point abandoned nested posts. The difference is that I look for different things on Reddit than I used to on Telltale. The nested comment sections work there because they're, you know, comment sections, and not discussion threads. And anyway, like I said, I mostly just lurk anyway. If anything, the way I use Reddit is more similar to how I used to follow pages on Facebook (before they started hiding anything I cared about from my feed and I gave up on that too). I never really replaced the "community with an off-topic section" aspect of Telltale with anything else, and I never really stuck my neck out and got back into engaging in online communities. I keep to myself much more these days, probably to an extent that's not really the best for me. One wonders how long it takes for the admins to approve new users, since they're apparently wary of trolls. I'm not completely sure, honestly. I got in day one during the 15 min they allowed people to register with unpaid email accounts. But I was also a member of two communities prior to the move from NeoGAF, so I also had a bit of help getting in. I think the approval process is faster than GAF though, but then again sending an application by mail would be faster than GAF (it took me 6 months to get approved there. I can only assume the moderators were arguing over whether my banter spamming on Telltale disqualified me). Nice to see a few familiar avatars here. @GuruGuru214 is correct - every game from Telltale Texas Hold'em to The Walking Dead is now DRM-free on Telltale's website. If you're having trouble logging in (whether on the website or on the game launcher), Telltale alum John Seggerson posted over at Mojo that Telltale is using Symantic Legacy Certificates. These aren't allowed in the latest Chrome beta. Using stable branches of browsers should work, but of course, that only will work until the beta changes don't become part of the stable branch. I posted a big bunch of answers to other FAQ's regarding problems with Telltale's games here if you're having other problems. This is still a thread. Apparently Skybound Games is going to finish off Telltale's last Walking Dead season, according to Robert Kirkman. So the forum is basically divided in two. There's the gaming side and the 'everything else' side. The hangouts section for each basically consists of dedicated topics for longterm discussions. So hangouts on gaming side are generally topics dedicated to specific game series or systems (like there's a breath of the wild hangout thread for example), hangouts on the etcetera side tend to be little communities (like there's a writing community, a film community, a politics community, etc). The Gaming/Etcetera primary forums are specifically for new news that won't have a lasting discussion, life questions, amusing anecdotes... basically anything that is expected to have a thread lifespan of a week or two max. Generally, I have a handful of hangout forums that I'm a member of and that's typically where you get to know people and they get to know you. And then the primary threads are where I browse to get news about recent events and movies/games coming out and stuff. Kevin Brunner [sic] was a Lovecraftian nightmare; an entity of fear that you seldom saw but could rend your life apart on a whim. The stories were of him being quoted saying that "[Brunner himself] is the only irreplaceable part of this company." as well as reprimanding and firing people seemingly without warrant. He was described to me by a designer that had to show their work to Brunner as "a sociopath". So nobody in my department believed for a second that Dan Connors stepped down of his own volition. Additionally, with this restructuring, our manager also left "of his own volition" Without having further knowledge of the history of the operations of the company, this is the point that I would mark as "The beginning of the end" for Telltale. But it was costing people their lives, the tight deadlines and constant rewrites that were directly because Kevin Brunner had an unwavering and unchallenge-able vision for Telltale games that would eventually spell doom for the company. Everyone at Telltale knew that the fans were stagnating on our formula. Even in QA we organized a small group to talk about how we could change it up in the hopes of presenting it to designers. But all of that would fall on deaf ears.